Find your IDE version in about dialog (Help > About). 1. From within Eclipse open the update manager by selecting Help > Install New Software…. 3. Select the WireframeSketcher plug-in and finish the installation. 4. Take a look at the User Guide to get started. 2. From within Aptana open the update manager by selecting Help > Install New Software…. 4. Select the WireframeSketcher plug-in and finish the installation. 5. Take a look at the User Guide to get started. 2. From within Titanium Studio open the update manager by selecting Help > Install New Software…. 1. 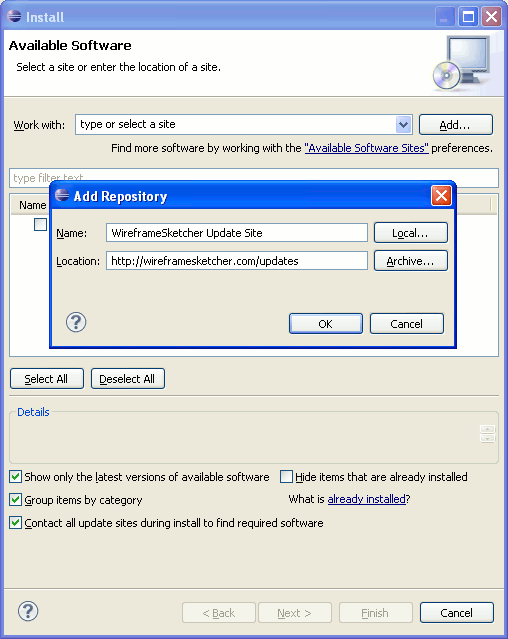 From within MyEclipse open the update manager by selecting Help > Install from Site…. 1. From within Flash Builder open the update manager by selecting Help > Install New Software…. 1. From within JBoss Developer Studio open the update manager by selecting Help > Install New Software…. 1. From within ColdFusion Builder open the update manager by selecting Help > Install New Software…. 1. From within Spring Tool Suite open the update manager by selecting Help > Install New Software…. 1. 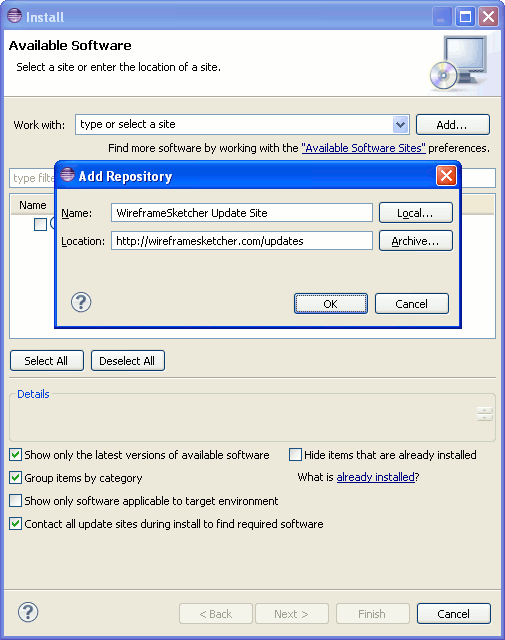 From within Zend Studio open the update manager by selecting Help > Install New Software…. 1. From within RAD open the update manager by selecting Help > Install New Software…. 1. From within Servoy Developer open the update manager by selecting Help > Install New Software…. 2. To install WireframeSketcher on Windows just run the installer after download. On Ubuntu/Debian install the package and then go to Applications > Graphics. On Mac OS X simply extract the archive to your location of choice and then run the app. 3. Take a look at the User Guide to get started. 4. Unzip the plug-in archive into your Eclipse installation directory (or eclipse/dropins folder for Eclipse 3.5 users). Make sure to merge the contents of eclipse/features and eclipse/plugins directories into the corresponding features and plugins directories of your Eclipse installation. 5. Unzip GEF and EMF archives into your Eclipse installation directory. Make sure to merge the contents of eclipse/features and eclipse/plugins directories get into the corresponding features and plugins directories of your Eclipse installation. 7. Take a look at the User Guide to get started.